Thank you to everyone who sent in requests for today's etiquette video. I received hundreds of comments and letters through the blog, YouTube, social media and my contact form on the author website. Clearly the topic of modern etiquette resonates with so many people. You would not believe the stories we read! I have enough material for an entire year :) Ben and I could not address each question, but answered a variety of conundrums in today's video. How do you handle the houseguest who is perpetually on their smartphone? What do you do when your theatre experience is sabotaged by a fellow audience member? What's the etiquette for grooming oneself in public? What should you say to a pregnant lady? How do you handle dogs at the dinner table? Is the wave of courtesy extinct? Find out our answers to all of these questions plus much, much more. 📍 MADEMOISELLE CHIC, my Japanese children's book, was featured in Yomiuri Kodomo Newspaper. 📍Leather bound limited edition copies of Lessons from Madame Chic are now available at Howchow and Gigi New York. They can be monogrammed as well. I just finished reading 20 Stylish Secrets I Learned While Living in Paris and enjoyed it immensely!! I cannot even express how this book has changed my thinking and the way I live now. It’s is amazing!! I can never thank you enough for taking the time to write your books. I am a changed women in so many ways now! I have always loved to entertain and go above and beyond for my family but things just got better after reading your first book!! Thank you suggesting to us to take time to pamper ourselves too! Thank you from the bottom of my heart!! Oh ya and I binge watch your YT videos too because I glean so much from you and your wisdom etc. etc. I get so excited when a new YT video is available!! Thank you! Thank you!! Also, thank you for not being ashamed to mention prayer! Thank you again!!! Off to read your second book! Yippee!! Hi Andrea, thank you so much. 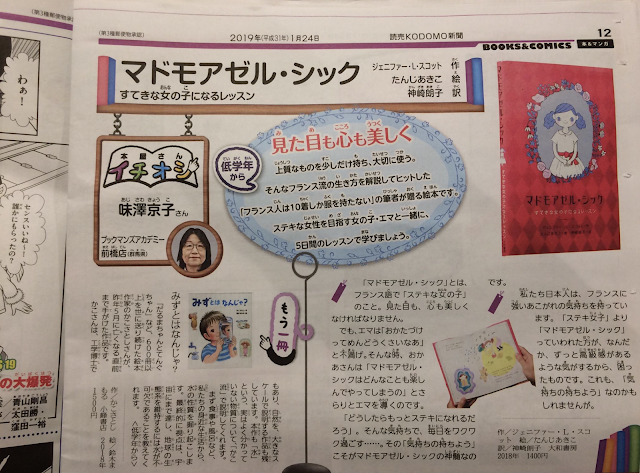 Your note on my author guest book "sparked joy" for me, as Marie Kondo would say :) Thank you for supporting my work in such an enthusiastic way. I think this is my favorite video to date. I had sent a question and even though you weren’t able to respond to it, I see the situation in a new light. I appreciate how you and your husband see the humor in these situations. The ending advice to try and work on your own behavior was beneficial. Would love to see more! Great video -- really enjoyed it. I think your last piece of advice really answered the unspoken question most people had when they sent their etiquette conundrums: what can I say or do to these people, who are saying or doing these outrageous things. As much as we wish there was something we could say politely, there just isn't. Most of the time, you should just work on yourself. I guess knowing that you're trying to do the right thing and setting the right example has to be enough. My dear friend has a saying that she uses often with her children: high expectations for yourself, grace for everyone else. They are words to live by! I completely agree that we all need to work on ourselves. However, I thought your followers were looking for ways to deal with others' rude behavior. As your followers, obviously we already know the things mentioned are, as Ben said, "No nos!" I think when you invite people into your home you have the perfect right to say, "We and the children love to visit with you. We have a "no phone/device" policy when we get together with friends." If they don't like it, they won't come again, and I don't think you'll really be missing much since they didn't engage with you before. Dogs at the dinner table -- this is difficult because some people are totally irrational about their dogs. I've been in this situation and I've politely told the hosts that I find it difficult to enjoy my meal and chatting with them with the dogs barking and begging. One couple apologized and now puts the dogs in another part of the house when we sit down to dinner or if they notice the dogs being bothersome before or after dinner. Another couple got extremely angry and asked if we'd lock our children away if they asked us to. First, we don't have children; second, children are not dogs and vice versa; and third, I've certainly been to the homes of people with children who feed their children before the dinner party or in the kitchen because they want it to be grown up evening. Not surprisingly, this couple never invited us to dinner again, which, if I'm honest, was a relief. Trying to eat dinner and carry on a conversation while a huge, drooling dog barks and jumps on me is not my idea of a good time. Maybe my status as a senior citizen colors my thinking. True, there are some things you just have to put up with and look the other way (like people flossing in public). But I think there are things you don't have to put with in life, especially in your own home. I agree with Ben's comment: "Don't invite them." Jennifer, I so enjoyed this video with you and Ben! As to the non-acknowledged gifts, I have also experienced this. I have to wonder why the young people couldn't at least use their ever present phone to call and just say thanks! I think part of the problem is that younger people are so used to using media to communicate (even e-cards!) that it just doesn't occur to them to hand write a note or use regular mail at all. Again, thanks for your videos and for your great sense of humor! Thank you Jennifer and Ben. And thank you DD for providing some insight and answers to the questions asked. I wish, Jennifer, that you would have provided some more helpful answers to many of your followers' conondrums. This video was so funny! I agree with the viewer who said to let your guests know your policy on smartphones and devices. Who knows, some people may actually realise how much they enjoy social functions without them. Jennifer, I agree with not doing makeup in public - anything involving personal grooming/hygiene should be private! I think reapplying lipstick is fine though. I don't even think you should clip your toe nails in front of your spouse because it certainly destroys the 'air of mystery' rather quickly! As for the food allergies, I would ask the family in question to provide you with a few appropriate recipes that they enjoy. You could also consider starting a small collection of recipes for such occasions so that it is not a stress every time you are asked. As a vegetarian, I always offer to bring a dish to share when invited to dinner if my hosts are not familiar with what vegetarians eat. This saves stress for my hosts and makes sure I have more than lettuce leaves on my plate at dinner! I love the two of you together! We use a cell phone basket at our house. When family arrives my husband meets them at the door and ask them to put their phone in the basket. He then deals with all the common objections “But I use it to take pictures“ or “I’m expecting a call“. He lets them know that we will keep the basket on the counter and if someone has need for their phone they are welcome to retrieve it, use it for the needed reason and return it to the basket. We have found it to be very hopeful with some family members who seem quite addicted to their social media. We don’t do this with all guests that come to our house but with people who are regulars or special gatherings we’ve managed to get people pretty used to the idea that interacting with others is better than staring at the screen. Jennifer, I've been a follower of your blog since you announced your first pregnancy (at least I think it was your first?) Anyway, I've been with you and enjoying your blog through all four children. Your personality, humanity, sense of style and encouraging "the Ten Item Wardrobe," which I adopted fairly early on, and which I still maintain because I love its simplicity. Whenever a friend complains about their wardrobe or the state of their closets, I tell them about my adoption of your "Ten-Item Wardrobe" philosophy early on, and they're always surprised because none of them seemed to have noticed, just that I always look "put together"...using your terminology, "presentable." I have to admit that it's only been somewhat recently that I've adopted your habit of dressing in the clothes from my "Ten-Item Wardrobe" on a daily basis, even if I'm not leaving my home. I've always been one to apply my makeup everyday even if the only people I'd encounter throughout my day may have been my children and husband. Now my children are grown, on their own; nevertheless, nowadays I dress everyday just as I would if I were going out in public, like "Madame Chic." 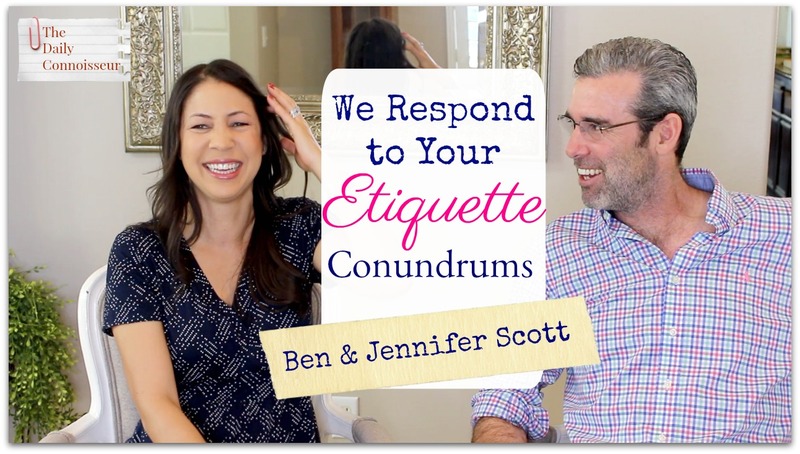 Love your blogs, all of them over these many years, and especially enjoyed this one about etiquette, which included your husband, Ben. Best wishes, Jennifer, to you, Ben, and your two daughters and now, two sons. I hope you'll continue your blog for many years to come because I'd miss it immensely otherwise. Ladies, thank you so much for watching our video and commenting. I was astounded by how many stories I received. I will be doing a follow-up video with Ben and we will most likely shoot this weekend, so please look out for part 2. I wish I could get to everyone's comment. This shows me clearly that etiquette is a very hot topic. Thank you for commenting and for being so supportive of the blog. I appreciate each and every one of you. Hello, dear Jennifer! I loved this video! It was a lot.of fun to watch you and Ben together. I also wanted to tell you about a video I just saw that might be interesting to you: https://youtu.be/YALgW15PVtQ Bernadette is planning to sew a Lady Sherlock costume and it seemed like something you might be interested in watching unfold. Enjoy! This is entertaining and intelligent YouTube viewing and I love watching you two together. Thank you both for your time covering a wide variety of etiquette conundrums. I am a "thank you traffic waver" and have been ever since I started driving in the Midwest and now out here in California. I think it creates a civilized and courteous (as Ben said) way of sharing the freeways, highways, streets and roads together. It doesn't matter if it's a car or a transport truck, I will always give a wave and while I do this without expectation, I hope that others may adopt it, too. It's as a polite way for commuters to communicate. I wasn't born in England, although my paternal side is from England, and I enjoyed the English glare you mentioned, because, without knowing the term, I've used it in movie theaters when people behind me are still talking as the trailers and film is about to start. It seems to work very well, and if it didn't, a brief request for quiet or seeing the theater manager would be next. Yes, please consider doing more of these videos together. You're the best Daily Connoisseur Couple!